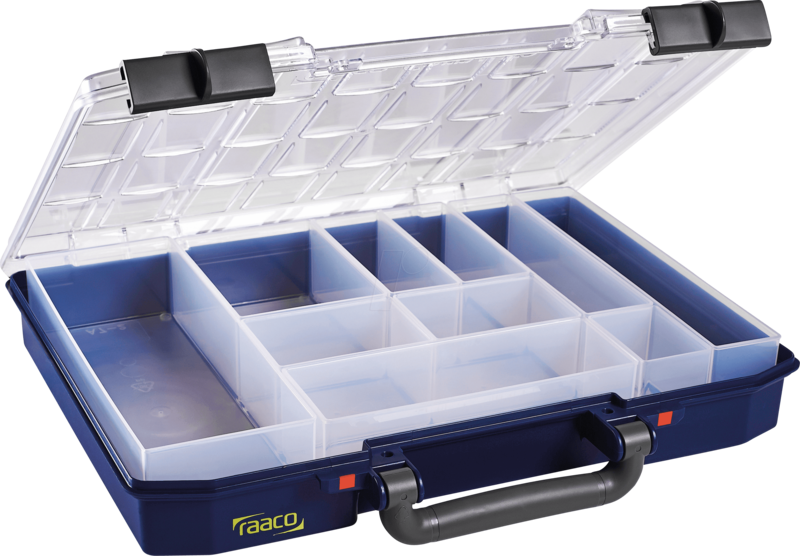 raaco CarryLite: Lightweight, robust and easy to handle. The CarryLite series consists of sturdy boxes available in two heights (55 and 80). The transparent lid with U-profile is made of impact-resistant high-quality polycarbonate, the base consists of polypropylene. Compared to steel plate solutions the complete CarryLite box weighs considerably less. At the front the CarryLite is equipped with sliding locks keeping the lid securely locked while the rear side is equipped with strong and tough external hinges. The red point on the sliding lock displays if the lid is open or blocked which avoids the unwanted opening of the lid. The CarryLite is equipped with removable inserts that allow to arrange the compartments as needed. The U-profiles inside the lid ensure that the content is kept in place during transport. The transparent lid makes it easy to identify the contents. 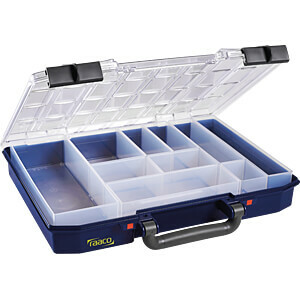 CarryLite 55 4x8-10 is a compartment box with 10 removable inserts, incl. sliding locks and handle. Grid systems in lid and bottom prevent movement of content.